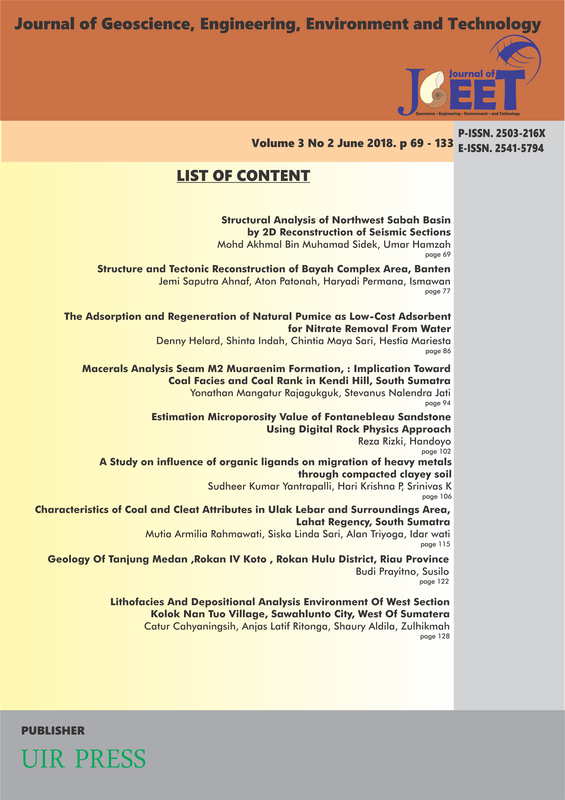 Abstract: The tectonic evolution of thrust fold belt and thrust sheet zone in Northwest Sabah basin was described based on balanced reconstruction of seismic sections representing Mid-Miocene to Recent deposits. The study area is located at the center of a wide crustal deformational zone bordered by the Sunda Shelf on the northeast, Sulu Sea in the southwest and the South China Sea in the northwest. Balancing cross section can be applied after the deformed geological structure geometry is accurately determined from seismic sections and 7 seismic stratigraphic unit from 15 Ma until Recent is consecutively restored. There are four steps involved in retro-deformation processes beginning with removing all faults displacements followed by unfolding the folds, isostasy correction and finally the removal of each compacted layer parts or decomposition. Wider fold wavelengths with least thrust faults were observed from south to north in the seismic sections ranging from 12 to 4 km with an average of about 7 km, while smaller fold wavelengths and more thrust faults were observed in the north based on the same seismic sections. In general, the reconstructed cross sections revealed compressional tectonic deformation activity as shown by shortening strain trending NW-SE. Measurement of total shortening shows that thrust fold belt is imbalance by an exceeds of 14.7 km and more active compared to thrust sheet zone which has only 0.9 km. Results of the study also indicate facies destruction due to shortening which is decreasing towards Pliocene or younger deposits. Abstract: The research aimed to reconstruct the geological structures and tectonics of the Bayah complex area. The structures found that grouped into regional structural patterns used to determine the ages and the events that responsible to its formation. The methods used in this research include field and studio method. Field method carried out to map the outcrops and record geological structures data using geological compass, GPS, tape measurement, and geological hammer, while studio method performed to process and analyze data using software such as Win Tensor, Dips, MapInfo Professional 10.5 and CorelDraw X4. The geological structure of the Bayah has varying patterns and ages. The fracture patterns show N-S and E-W direction which is belong to Sundanese and Java Pattern formed in range of the Early Eocene to Pliocene. While the faults that have direction of SW-NE and E-W are classified into Meratus and Java Pattern. However, metamorphic rock foliations show NW-SE and N-S direction that belonging to the Pre-Tertiary Sumatra Pattern. The three faults of this research are estimated to be formed by the effect of orogenesis that occurring in different events and ages. JSA-014 fault is predicted to form due to orogeny I or orogeny II in the Early Oligocene - Middle Miocene, this fault classified as the 2nd order right lateral wrench fault. JSA-034 fault is formed by orogeny I in Early Oligocene - Middle Miocene, this fault is also classified as the 2nd order right lateral wrench fault. While JSA-080 fault has relatively young age that formed due to orogeny III in the Middle Miocene - Pliocene and belonging to the 3rd order left lateral wrench fault. Abstract: The Muaraenim Formation is a coal bearing formation in South Sumatra Basin of the Late Miocene – Pliocene. Shell (1978) divides this formation based on coal seam content are: M1, M2, M3, and M4. Coal seam in this area include in seam M2 member, with the general characteristics of the presence of silicified coal on the roof and floor of coal seams as a marker. The administration of the research area is located in east Kendi Hill, South Sumatra. The Kendi Hill is composed of adesite igneous rocks that intruded Muaraenim Formation in unconformity at the time of Pleistocene. This study aims to determine the environment of coal depositional based on maceral analysis and determine the factors influence the physical characteristics of coal seams in Kendi Hill. Data that has been obtained from the field, then conducted a selection process. The number of samples analyzed were nine sample based on near and far to the Kendi Hill spread from the southern, central, and northern of the location. The result of the analysis will display the maceral diagram. Megascopically, coal seam in the Kendi Hill are black, dull with bright, uneven – subchoncoidal, blackish brown in streak, have a pyrite and resin. The thickness of the coal seams ranges from 0,45 to 14 meters. Based on the maceral analysis, the coal seam in the Muaraenim Formation is composed dominated by vitrinite, then liptinite, inertinite and mineral matter pyrite (1,6-6,6%). Vitrinite reflectance of coal in the research area ranges from (0,37-0,48%) that included to the Sub bituminous – High Volatile Bituminous C. From the results of Tissue Preservation Index and Gelification Index value indicated that the environment of coal depositional in the research area was a limnic to wet forest swamp. Whereas the deposition of the Muaraenim Formation in deltaic environment (Transitional lower delta plain). Abstract: The technology of digital rock physics (DRP) allowed to predict the physical properties in core data sample, for example to predict value of porosity of data sample. This research applied the digital rock physics technique to predict the microporosity in sandstone sample: Fontanebleau Sandstone. The data are digital images from Fontanebleau Sandstone with high resolution scanned from micro tomography CT-Scan processing. The result of image processing shown in 2D and 3D image. From the data, the value of microporosity Fontanebleau Sandstone are beetwen 6% - 7%. This result confirmed by the quartz cemented sample of Fontanebleau Sandstone. The scale and sub-cube give the different value of microporosity which is indicated the scale influence to value of porosity value. So the simplest and best way is to average the all result from sub-cubes. Abstract: This paper presents the feasibility study on utilization of locally available clayey soil as Compacted Clay Liner based on its contaminant migration capacity under the presence of organic chemical EDTA (Ethylene Diamine Tetra acetic Acid) which is abundantly released into the environment. Lead, Nickel, cadmium and chromium ions was selected as contaminants and its migration properties are assessed by conducting column studies with a single and multiple heavy metal solution with the EDTA. From the experimental investigations, it is revealed that with the presence of EDTA, the contaminant breakthrough time get reduced due to soluble metal – EDTA complex formation. At pH 2, interaction with multi metal, the mobility was increased and the order of mobility was observed as Cr > Cd > Ni > Pb. With the presence of EDTA in multi metal system at pH 2, the order of the mobility was Cr > Ni > Cd > Pb and at pH 7 the mobility of heavy metals were increased the order was Cr > NI > Pb > Cd. This study reveals that locally available clayey soil is capable of retaining heavy metals and it may be used as a compacted clay liner, where organic chemical like (EDTA) ingression is present. Abstract: The research conducted in Ulak Lebar Area, Lahat Regency, South Sumatra. The focus of this study is on the Muara Enim Formation as it is known as the main coal-bearing formation in South Sumatra Basin. The research is aimed to determine the characteristics of coal based on its physical properties, also knowing the cleat development at the coal seam in the research area. The methods used such as literature study, field observation and laboratory test. Field observations included the observations of coal megascopic appearance and cleat attributes analysis such as the measurements of cleat orientation, aperture, spacing and length. The analysis result of cleat at LP 2A and LP 2B shows a relatively similar such as spacing value ranged between 6 - 9 cm and 5.5 – 8.6 cm while the aperture value ranged from 0.05 - 0.2 cm, and 0.05 - 0.25 cm, whereas at LP 67 the spacing value ranged from 1.5 to 3.3 cm and the aperture valued between 0.1 - 0.3 cm. A rather significant difference between the cleat spacing values of LP 67 towards both previous observation stations is indicated by the geological processes occurred during the coalification process thus affected the development of cleats in coal, the geology structure control is characterized by a relatively large aperture and smaller spacing values. The laboratory test conducted is maceral analysis, shows the coal in the research area is dominantly composed of vitrinite (74,8%) and the vitrinite reflectance value is 0,40 indicating the coal classified as sub-bituminous rank. Abstract: The Administrative of research area has been in Tanjung Medan, Rokan IV Koto, Rokan Hulu, Riau Province and geographically located at 0 ° 37 '28.488 "- 0 ° 40' 10.3692" LU and 100 ° 24 '55.6884 "- 100 ° 27 '37.5804 "BT. Research method used approach method and laboratory analysis to get data of geology modeling and re-construction of geological history in research area. Based on surface observation, the geology of research area consists of Slate (Permian-carbon), Granite intrusion (Permian-Trias) with distribution SouthWest-SouthEast on the center of map. Arenite Sandstone unit (Easly Eocene) unconformity with slate on the bottom. Alluvial Rokan river crosses all type off rocks from north to south of map. While structure growth in the research area have been joints structure with main stress Southwest-NorthEast, its similar with trend tectonic setting of Sumatra island, on the other hand reverse fault indicates the formation of a basin of extension stress in the early Eocene. the formation of basins in basement rocks begun at the time of the formation of the north-south trending northern form of the fault block forming horst and graben as well as accommodated the precipitation of pre-tertiary clastic materials. Whereas the Oligocene trans-tensional compression system accommodating the sedimentation system in the formed of arenite sandstone (SBPa) unconformity above the basement rocks simultaneously on the basin base decrease. The distribution of arenite sandstones based on the geological reconstruction covering all parts of the rock distribution which then undergoes the same weathering process of the formation of Bukit Barisan volcanic path that controls the development of geological structure up to the present. Abstract: Research areas were located in the west of Kolok Nan Tuo Village. Geographically this area is located at coordinates 00 ° 36'57,85 '' - 00 ° 37'56,89 '' latitude and 100 ° 42'10,08 '' 100 ° 43'47,28 " BT. The methods used in research is geological mapping. Based on the results of stratigraphic research area is divided into three units consist of: Crystalline Limestone Unit (SBGK) consisting Crystalline Limestone of and mudstone lithofacies, Conglomerate Units (SK) consists of polymic conglomerate and sandstones greywacke lithofacies while claystone Unit (SBL) lithofacies consists of claystone with sedimentary structures is flake. Result of research can interpreted Depositional environment based on type of lithofacies include of grain size, sedimentary structures and content of fossils. SBGK interpretated depositional environment is a basement of basin, SK depositional environment debris unit limestones can be seen from fragments of conglomerates that many there are crystalline limestones and mudstone that make up the alluvial fan (deposition surface) and lithologies clay from sedimentary structures where rock mudstone generally in doposition the current flow that quiet can form sedimentary structures flake and properties of claystone which carbonated an identifier depositional environments sea so can be determined that the environment in the form of neritic environment.